According to the U.S. Bureau of Labor Statistics, there were nearly 3 million workplace-related injuries and illnesses reported during 2012, resulting in an incidence rate of 3.4 cases per 100 equivalent full-time workers. Additional research notes there were 219,630 non-fatal workplace injuries involving falls, slips, or trips and 704 fatal injuries in 2012. Each year, there are roughly 85 deaths and nearly serious 35,000 injuries caused by forklifts. Because 46% of forklift injury accidents involve pedestrians, Cisco-Eagle developed the AisleCop® Safety Gate System to help restrict pedestrian access to aisles when forklifts are in the vicinity. The gates can be set up in many different configurations customized to a company’s specific facility, traffic rules, timing, or processes. With the AisleCop® system, boom arms are installed on one or both sides of the pedestrian crosswalk, which provides a visual, physical barrier to forklift traffic. If a forklift gate encounters an obstruction in the aisle, it will immediately return to an upright position. Warehouse doors and blind entry points pose serious threats for forklift operators and pedestrians. To help protect pedestrians from blind spots they may encounter while leaving an office, break area, or another part of an industrial facility and entering an area where forklift traffic is present, Cisco-Eagle’s AisleCop® warehouse entry gates can prove a crucial safety precaution. In this system, the gate is a visual barrier that helps the pedestrian understand when he or she is entering a potentially dangerous traffic aisle. It doesn’t scan or lock. Manual gates automatically detects pedestrians when they cross its threshold and trigger a bright, flashing LED strobe light to warn forklift operators of pedestrians in the crosswalk. This is a more affordable, but still enhanced level of protection for pedestrians in a forklift operation. By surrounding columns with a cushion of impact-absorbing air, easy-to-install column protectors act as a bumper around a building’s exposed interior columns. OSHA estimates that there are 680,400 accidents, each year, involving powered industrial trucks. Approximately 90,000 workers suffer some type of injuries in these accidents. 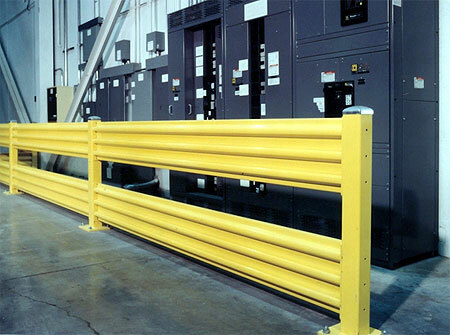 Steel guard rails can help to protect people, machinery, inventory, and buildings from impacts, resulting in fewer workers’ compensation claims and less missed time at work. Unlike traditional guardrail, which can crush upon impact, heavy duty pipe guardrail often withstands severe impacts. Heavy duty pipe guardrail is made from Schedule 40 and Schedule 80 pipe, covered with polyethylene anti-static sleeves that always look great, and will never chip, rust, or need to be painted. Pallet rack post protectors, which install in seconds, help to reduce forklift collision damage and prolong the life of rack uprights. The honeycomb-type design creates pockets of flexibility that cushion impacts to eliminate or reduce any damage that may be transferred to the rack upright. Overhead gates for mezzanines block workers from entering the gate area while it’s open and being loaded with pallets from below. When the gate is open the gate on the outside of the mezzanine is closed to keep workers from falling off the mezzanine. Folding rail dock safety gates prevent accidents at the edge of loading docks, truck-loading pits, or other hazardous areas by closing off the edge with secure, visible edge-of-dock safety gates. The dock area is often a “magnet” for industrial injuries, and one of the chief culprits is edge-of-dock falls. These gates help prevent those types of accidents. Similar to folding rail dock safety gates, straight rail dock safety gates prevent accidents at the edge of loading docks, truck-loading pits, or other hazardous areas by closing off the edge with secure, visible edge-of-dock safety gates. Safety barriers for warehouse, industrial, and other facilities protect workers, equipment, and inventory from forklift collisions, falling, slips, and other accidents. What precautions is your organization taking to keep employees safe? Stay tuned for additional video highlights from our new Material Handling Video Library.